The Walk, which was organized by the city manager department, began at West Ave & 14th St. and concluded at the Gaythering Hotel on Lincoln Rd. Over 4o residents walked and communicated with 12 city staff people who represented various city departments. Here are the concerns that were voiced by the residents with city response and updated progress reports. We ask that street ends, especially 10th and 14th Street, need beautify landscaping, screening for pump station, should allow view of Miami skyline. There is already a city policy to have pump stations screened. We ask the City to trim trees in the ROW even though there is a new ordinance that makes homeowners responsible for all maintenance. The city recently passed a new law that makes homeowners responsible for all landscape up to the street even on city owned property. And homeowners are responsible to remove all litter up to the crown of the crown of the street. We ask for application and instructions for condominiums to be exempt from lobby sprinkler system. There is a short window of opportunity to receive an exemption, need approval of majority of unit owners and file with the state who will consider approving the exemption. Condos have short term rentals (even illegal AirB&B short term rentals) may not apply for exemption. We ask the Fire Dept to advocate for an ordinance that mandates a sign on the wall in each commercial buildings entrance that displays maximum occupancy. Typically a certificate stating maximum occupancy is available in a draw in a desk somewhere on the premises of the bar, restaurant or store. You would have to ask a city commissioner to change the law . At 1500 Bay Rd, Flamingo drop off/pickup, improve pedestrian safety. Paint a four sided crosswalk, build sidewalk bump outs, reduce length of driveway cutout, create protected “pedestrian island” in the middle of the driveway. We requested that the County install high emphasis crosswalk at north and west side of the intersection. Currently, high emphasis crosswalk is installed at south leg of the intersection (ladder looking painted design). We will also request that the County installs high emphasis crosswalk on east side, however, the County currently does not install high emphasis crosswalks at stop controlled intersection approaches. Nevertheless, we will make this request. With regards to pedestrian crosswalk at north leg of Bay Road/15th Street, even though the County advised the crosswalk markings and signage will be implemented soon, the County states the ramp located on west side of Bay Road is still not ADA, thus the County will not proceed with installation of the crosswalk at this time. We are working with our Public Works Department to reconstruct subject ramp as soon as possible so the County can install pavement markings/signage on north leg of the intersection legally establishing the crosswalk (similar to pedestrian crosswalk installed on south side). We sincerely apologize for the inconvenience. We understand you concerns and pursuant to our field meeting we are organizing internal meeting with multiple departments to discuss current challenges at this location and the potential solutions. We hope for the meeting to take place within the next two weeks. In the meanwhile, we will work with our Parking Department to install “NO PARKING” signs on west side on Bay Road at 15th Street. We hope that signage will help deter illegal parking. For side streets between West Ave and Alton, make green traffic signal longer, especially at heavily used side streets like 15th Street and Lincoln Rd. The City of Miami Beach Transportation Department conducted field observations and recommended cycle length to be reduced. Pursuant to our recommendation, the cycle length along West Avenue was changed to 65 seconds in comparison to previous 130 seconds. This basically means that vehicles delayed along side streets on West Avenue experience now one half the delay time in comparison to delay experienced last week. We will monitor newly implemented changes and make changes if warranted. We ask ti make a policy to install a garbage can on every corner and on the Baywalk or at the entrance of Baywalks. If sanitation cannot commit to this then please tell us what you can do. We ask that the sidewalk velvet rope in front of the night club at 1220 16th Street. Per the ADA law, must maintain a minimum of 5 feet distance between sidewalk tables and obstructions per the ADA law. Report the violation and we will take care of it. We ask for removal of private property fences and hedges in the right-of-way (ROW) so we can use the full width to accommodate bike lanes, wider sidewalks, landscaping and street parking. Removing privately owned objects from the ROW will be taking place as the street renovation progresses. Private property owners are responsible to replace fence and hedges if they so desire. Although new hotel development is prohibited in the West Ave neighborhood, three recently appeared on 14th Street and 13th Street. 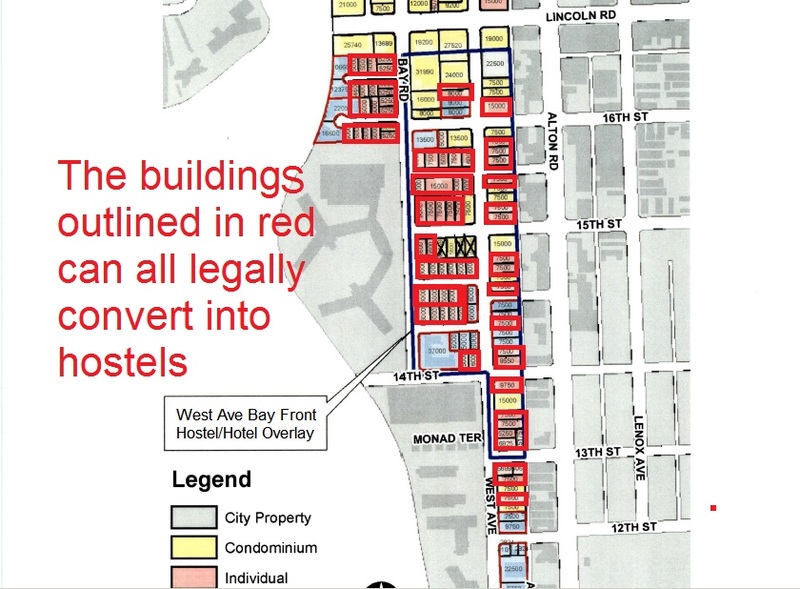 These are legal short term rentals because hotels, hostels and guesthouses are allowed in existing low rise buildings in a carved out sections of the West Ave neighborhood. What is prohibited is new development. We ask that all existing mature trees be preserved during street renovation, especially the row of 10 year old trees on the south side of 14th Street in front of the Waverly. We will note that and do our best to save them. We ask that you add curbs, gutters and street parking on the side streets in front of the single family homes where it does not currently exist. Curbs and gutters will be added here. But new street parking spots will only be added in front of a home if the homeowner wants it. This entry was posted in Uncategorized on November 30, 2015 by wavna305.